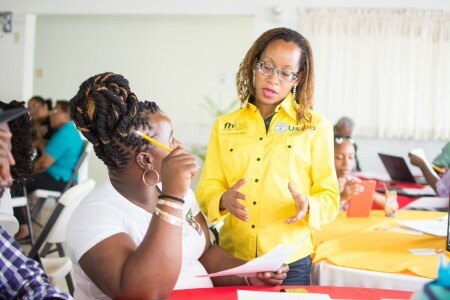 Friday, June 29, 2018 marked the launch of Local Partner Development’s Stepping Stone to Success Training Program, with its first phase offering support to twenty organizations operating in Central Jamaica. Stepping Stone to Success is an innovative intervention that will offer individualized training support for a select group of up to twenty community-based organizations (CBOs), and grassroots organizations in three regions: Central Jamaica, (St. Catherine, Clarendon, Manchester, and St. Elizabeth), Western Jamaica, (Westmoreland, Hanover, St. James, Trelawny, and St. Ann), and Kingston Metropolitan/Eastern Jamaica, (Kingston, St. Andrew, St. Thomas, Portland, and St. Mary). Over the ten months of the program, each cohort of participants will receive tailored support, mentorship, and practical, skills-based training on how to improve their community work and the sustainability of their groups. Organizations from Central Jamaica which are participants in the first cohort of Stepping Stone represent a diverse array of groups, including Community Development Committees, youth clubs and sports clubs, farmers’ association, foundations, and religiously-affiliated groups. Based on the positive feedback from attendees at the first workshop for the program, Local Partner Development anticipates offering a holistic organizational strengthening intervention that addresses each group’s needs while also fostering the creation of a collaborative and supportive environment for community-based and grassroots organizations. Please stay tuned for more information on the application process for future cohorts. Information on upcoming cohorts will be posted on our website, will be published, and will be circulated widely to the civil society organizations.